The museum was part of a planned permanent international fair designed by the Brazilian architect Oscar Niemeyer in the early 1960s, reports The Guardian. The building is decaying, including rusting steel reinforcements and concrete carbonation. The atrium’s basement ceiling collapsed in 2016. The 100-hectare (250-acre) site’s 15 existing buildings also include a domed theatre, an atrium, an arch and collective housing. But the country’s 15-year civil war halted the project in the mid-1970s and today, the abandoned fairground stands empty. With the local conflict now over, residents, civil society groups and international agencies are actively trying to restore the city’s dynamic and change its public image. Architect and activist Wassim Naghi estimates that up to $40m (£31m) is needed to treat the concrete and make it safe again. 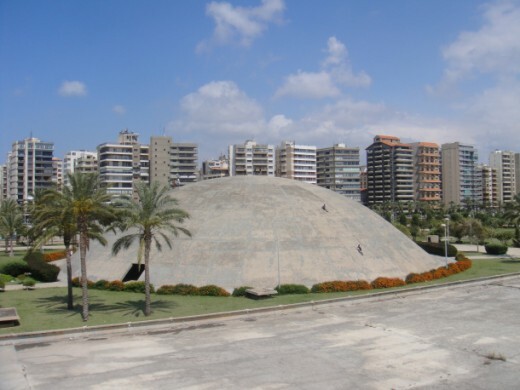 In 1962 Oscar Niemeyer flew in a helicopter over the outskirts of Tripoli, Lebanon, reports Architectural Record. After two circuits over the city he had decided the best location for the fair. At the time, the Brazilian architect was riding the wave of success from his work in Brasilia, the new capital of his home country. Niemeyer’s revolutionary designs had spurred a flurry of interest from international clients, among them the Lebanese, who gave him nearly 250 acres of land to design the grounds for a grand World’s Fair meant to showcase the country’s development and innovation. The architect completed his plans in 1963, including a wild array of concrete structures that incorporated elements of traditional Arab style into the distinctly modern aesthetic he perfected in Brasilia: a mushroom-shaped helipad over a subterranean science museum, a concrete dome housing an experimental theater, pyramid structures with star-shaped footprints, and a boomerang-like “Grand Ouverture”—the main exhibition hall. Construction began in 1967, but the outbreak of Lebanon’s civil war in 1975 brought the slow-moving project to a halt. The forgotten fairground was renamed after former Lebanese prime minister Rashid Karameh. 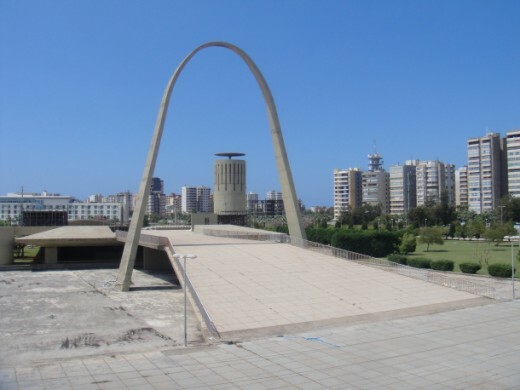 Activists led by the Union of Architects in Tripoli are campaigning for UNESCO recognition and for the completion of Niemeyer’s original design, turning it into a public park and historic site. 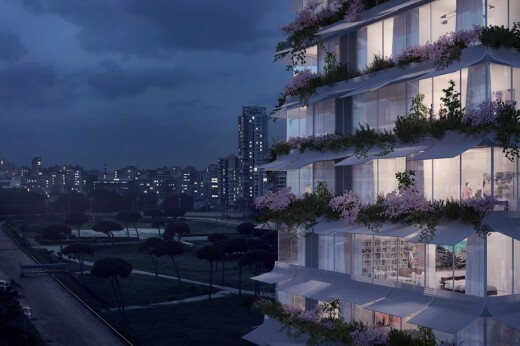 In 2000, a portion of what Niemeyer envisioned as a residential complex became a nondescript Quality Inn hotel; recently, a member of parliament proposed turning the fair into a tech hub and university under a plan called Tripoli 2020. The site has been on the World Monuments Fund’s biennial Watch List for a decade. 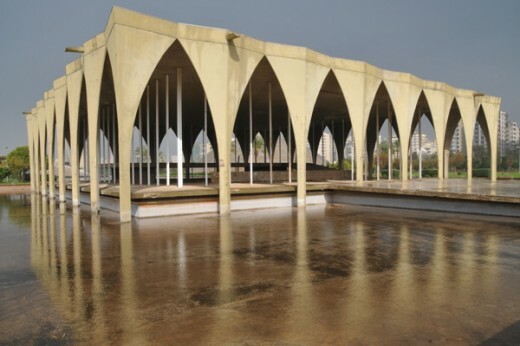 Six months ago, a group of concerned architects and activists launched a campaign to force the Lebanese government and the exhibition’s board of directors to make the grounds a protected cultural landmark as a UNESCO world heritage site, the same designation granted to the entire city of Brasilia in 1987. 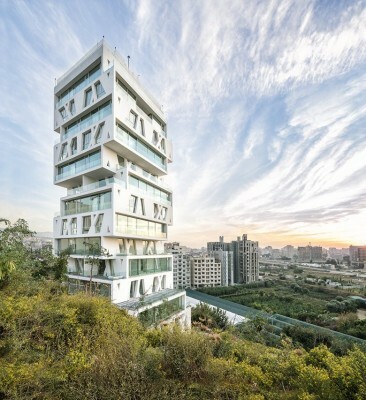 Oscar Niemeyer’s International Fair in Tripoli, northern Lebanon, was intended as the foundation of a new city quarter, but civil war intervened and it was never finished, reports www.iconeye.com. Half a century on, its mysterious geometric forms stand like a modernist Shangri-La. 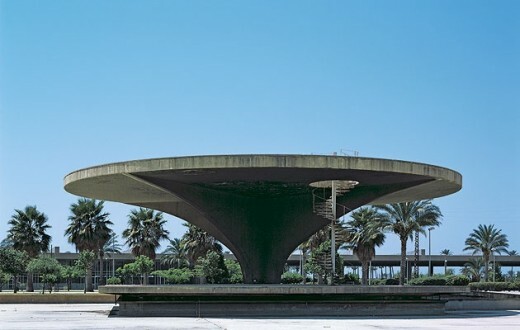 In 1962 Oscar Niemeyer was commissioned to build an International Fair in Tripoli, in northern Lebanon, but it was left unfinished when the civil war broke out in 1975. Niemeyer was invited by the Lebanese government to design a permanent International Fair complex for Tripoli. He was chosen for his facility in designing buildings in warm climates and also, as a card-carrying Communist, for his politics. Niemeyer’s Brasília vividly expressed the cultural pride of a developing nation. His ambitious plan for Tripoli proposed a new city quarter including zones for commerce, sports, entertainment, and housing, with the fair at its centre. The Rashid Karami International Fair was intended as a permanent fairground and exhibition complex, with construction beginning in the early 1960′s during something of a golden age in Lebanon, according to thevelvetrocket.com. In 1975, just prior to the completion of the complex though, the civil war started up and the site was abandoned (although it was allegedly used briefly as a weapons storage area by the Syrians). 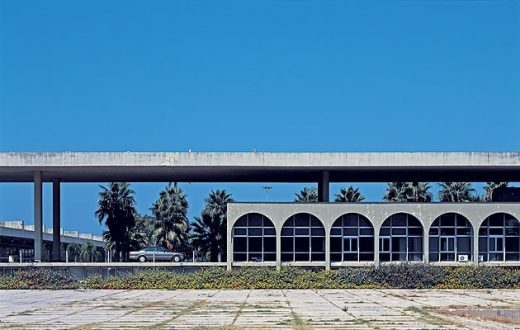 Today, the Rashid Karami International Fair rests just as it did when it was abandoned in 1975. The International Fair of Tripoli constitutes one of the still too unknown major works of Brazilian architect Oscar Niemeyer, according to www.patrimsf.org. At the demand of the Lebanese government, the projct was launched in 1963 and the construction work lasted from 1968 to 1974 but the Fair never opened because of the war that devastates Lebannon until 1990. At the beginning of 2004, the Tripoli Chamber of Commerce and Industry launched a project aiming at transforming the International Fair into a “touristic village intended to welcome millions of visitors every year”, like Disneyland. The published images of the project show a true massacre of the Niemeyer architecture, a transformation of the existing buildings without a care for either architectural coherence or the destruction of the place’s magic. Although the first steps of the project have been taken, it is still possible to stop this project that destroys one of the essential benchmarks of Tripoli and of modern Lebannon. PSF calls for an urgent mobilisation to launch an international campaign to save the Tripoli International Fair.